1. The yellow brick road lighting (1-10 or whatever) is always on in normal game play from the start (yellow) ... there may be a few other things always on now, like TOTO but I'm not 100% sure what is normally on/off. 2. In "save" (TNPLH or TOTO) or "special" modes (like RESCUE) all inserts on the playfield are on and white. So, in the first TOTO save you'll have all white solid inserts and then the ramp will be blinking white. I am almost 100% sure the other inserts were off previously. 3. All of the LED lighting is extremely bright and the LED brightness setting (low, med and high or whatever) does nothing to change this. 4. The RESCUE letters are now a very vibrant yellow and not sort of orangish, definitely noticed a change here. The last thing I did on the machine was put it back together after working on the castle playfield. I checked all LED connections that I touched (all lights work/turn on so nothing is unplugged) and rebooted it. Recently (within the past week or so) I updated the software, however I am almost sure it worked fine after that (the LEDs were acting normally). Not sure what to do, only familiar with old style lighting. Thanks! These symptoms indicate a bad led board, but it might still just be a bad connection at a single board. To check more carefully, you can bypass one board at a time and see which one changes the situation when removed. It's a hassle, but it's a way to methodically troubleshoot . Go into the individual LED test, leave it at white and slowly go through each one until you find out the first one that has an issue. If you get through them all and don't see a problem go back and try it on other colors but white will probably identify your issue. Once you find the first one you can usually bypass that, disable it in the system settings and then test / play again to ensure you found the problem and that there aren't more. My guess if you'll find one of the small GI ones, possibly under the munchkin mini PF or the right sling or return that are causing your problem. Good luck, it can be a bit of a PITA. Hum, I think I screwed something up. I was trying to debug each board/connection and I unplugged power to some of the main boards (W6 and W3) while the game was on. Apparently this was not a good thing to do? When I plugged them back in they would not turn on and some other boards north of those are also out now. Resetting the game did nothing. I wouldn't think it would be a fuse since they power is daisy chained and I don't even think my version of the game has the individual fuses for LED circuits (according to the manual). I was spending a good amount of time reading about the LED setup in the manual. I didn't realize that my printed manual is missing a lot of that content (apparently it was all added after my game was produced) and just stumbled across it in an online version I downloaded. Did I mess something up royally? As far as testing goes, the only thing I noticed was that the left orbit GI might be out. Otherwise, I went through every LED in white and nothing stood out. A few were sort of "tinted" a different color (the last O in TOTO was a bit reddish). When I first enter the menu all of the lights go on white. When I enter the LED individual test just one LED is on, so in general they were working decently. I found one wire (the one from the IO to W6) which was sort of repaired and was fraying, I'm looking to order one of those but I am not sure if that is an issue. I can temporarily hold the wires together and nothing really changes, if I seperate the wires a bit some of the boards upstream dim a bit but that's all. I tried turning off the orbit LED in the game settings and nothing changed as far as the overall function/issue with the LEDs. 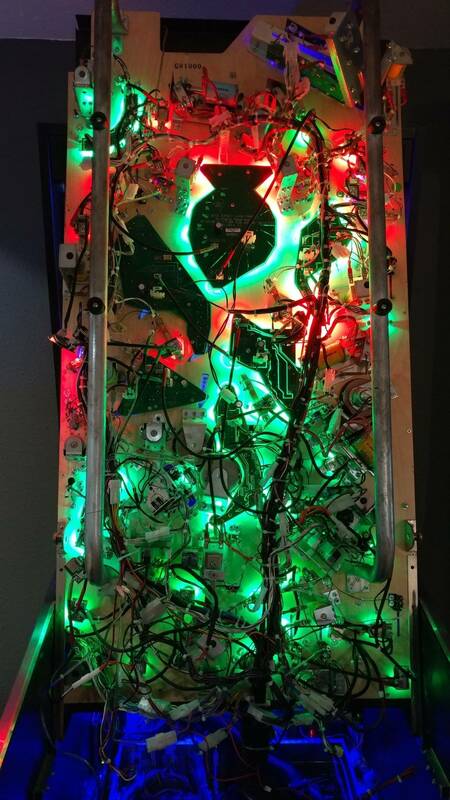 During the ALL LED test (before I unplugged those boards) about half the playfield was on white (the color selected) and the other half was various colors. Mostly red, a few green here and there and some of the GI were blue. Based on my reading of the manual it looks like I need to deduce what "string" of wiring to which board is causing the issues and bypass that board. Do I have to do all of this while the game is off? It's hella time consuming to move one wire, turn it on, turn it back off, etc. What exactly am I looking for when testing each LED? Ones that don't turn on? When you bypass a board, you have to REMOVE that board from the list of boards in the settings or things will not work right. And, when you replace the bad board, you have to add it back to the list or things will not work right. Basically find the board in the chain after which things are wrong. It's either that board, the one before, or the one after you need to bypass. Then remove the bypassed board from the settings. Continue until all bad boards are bypassed and the R, G, B, W tests have lights all the same color in each. Crap, just turned the game on and no lights at all now. My manual says there are no fuses for lighting. I checked the fuses and they look ok, all the lights are lit up next to them. The smaller power supply (which all purple wires go in to, obviously this looks like the DC power supply for the LED boards) was already unscrewed so I opened it up and there is one fuse in there which looks fine as well. Suppose I should try and call JJP. *Ok, called and left them a message. Call backs seem rare so I will probably call again tomorrow. If you got the chain wrong and the first board is plugged in backwards or not plugged in, you'd get no lights. Why just look at stuff? You can check for power if you use a multimeter. It'll answer a lot of questions for you. Thanks, just got a call from Lloyd and he basically reiterated what was said here. He had me check board power and it's 5v so that's good. I am going to do some bypassing of boards now and see what lights up. Geesh, so many things going on here. I started tracing, unplugging and plugging back in. 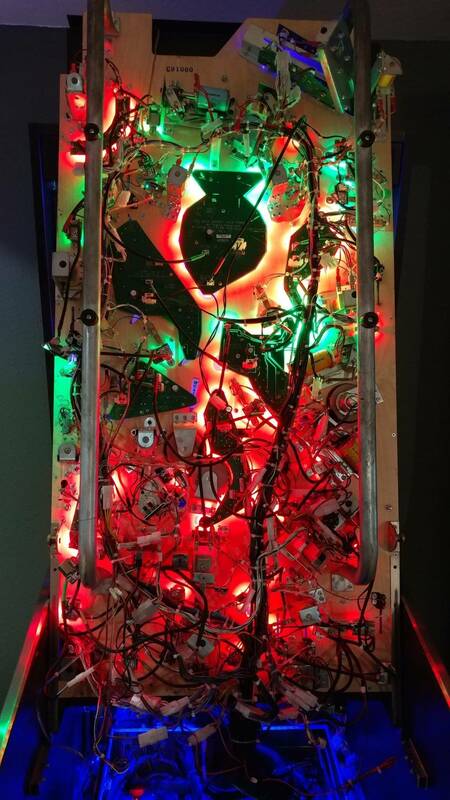 When I put the game in LED test and turn the color to red, for example, the lower half of the playfield is red. Some of the upper half is red, some off and some green. I haven't found a board yet that I can unplug or bypass (only can reach the cables so far) that changes the top half to the proper colors so I'm not sure where to go from here. I am going to call Frank in the morning and see if can relay exactly what I'm seeing so he might be able to point me in a better direction. The big pic is the game on LED test with RED selected. The other pic is the one board that doesn't light up at all, interesting to see that sticker on there. It seems like it was replaced last year and that is a QC check? I'm going to try and do some more plugging and unplugging. Btw, it looks like the main IO cable to W6 is just like any other cable and is very long, so having an extra one of those means you could probably bypass any board, anywhere. Mine is messed up so I am going to order two so I can do this in the future. Got any boards bypassed but not off in the software? That's what gives you the red/green mix thing usually. Save the $40 you'd spend on the extra-long bypass cables toward a 2.0 lighting kit. Don't throw good money after bad. Once you sell the 1.0 boards that are good, you'll only be out about $500 OOP and you'll have a rock-solid system. First, "borrow" the W1 to board 20 cable, then use it to jumper from W7 to board 28 (bypassing W5, which looks like it may be bad) paying attention to the red and green blops on the cable ends to make sure you have the cables right. Did that bring the red forward to more boards (or even all the way to board 20 where you borrowed the cable)? Do the G, B, W lights before board W5 all light correctly (the same)? Even when I am test mode (All LED on) do I need to turn off a board in the game settings if I bypass it? Ok thanks... ugh, that's going to be a long process. 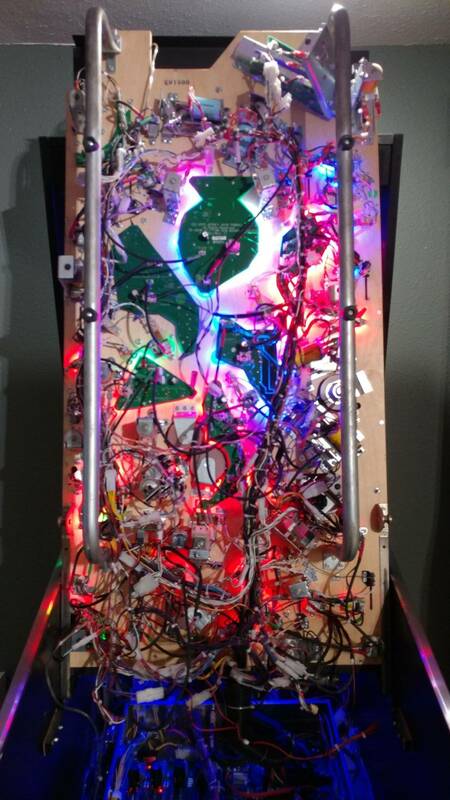 Not sure I can even see the board settings when the playfield is up. Considering the 2.0 upgrade kit, install looks like a fun time. Did you talk to Frank? Can I help? Only worry about taking the boards out of the system menu list once you have what you think is a "good" chain of lighting set. It doesn't matter much for the all led test. Use the map of the light system to mark the board(s) you've bypassed while the PF is up on a paper or your phone, then just go into the menu and set the bypassed ones to off all at once. 2.0 install is not hard at all, just a single time-consuming event over a long day or a weekend if you break it up. But with the notes people have posted in the upgrade thread for it, it's WAY easier now than when there was nothing for the first few of us that did it. The time you spend on the 2.0 will be WAY less than that spread over months or years chasing 1.0 problems and ordering/installing replacement parts. 2.0 is rock solid. One and done, which is appealing. Oh ok... because I'm still getting a LOT of mixed green and red in the test (and they reverse when I change the color to "green" in the test, but blue works fine). So I'm trying to start at the beginning and test out each board, bypass, etc. I am assuming that some board(s) is/are causing the red/green issue across the whole game and it's not just each board itself? I did replace one small board and it fixed the red/green issue with that one board, so it seems like it could be isolated to each board but that would mean many, many boards all failed at the same time. So it seems more likely that one or few boards are causing the issue? I'm not so well versed in how it all works in that kind of detail. Butch incorporated a lot of your notes in the new version of the kit instructions too. The kit itself got a slight modification which required new install notes. Ok, so everything should work in the test while bypassing boards without changing any of the settings in the game menu for which boards are bypassed? That is what I assumed, so that is how I was testing. But there seems to be some major issues as with all the bypassing and detection work I still have many mixed colors (green on when it should be red). I am not sure if that means each of those boards is bad or if it could be just one or two boards causing all of the upstream issues. I'm going to detect more just to see if I can figure it out but might just give up and go the 2.0 route. Don't worry about the red green until you have a continuous chain of light by bypassing boards that are stopping the light from getting around the circle/daisy chain. Once you have that, then make a note of the bypassed boards, take them out of the system menu and proceed with testing. 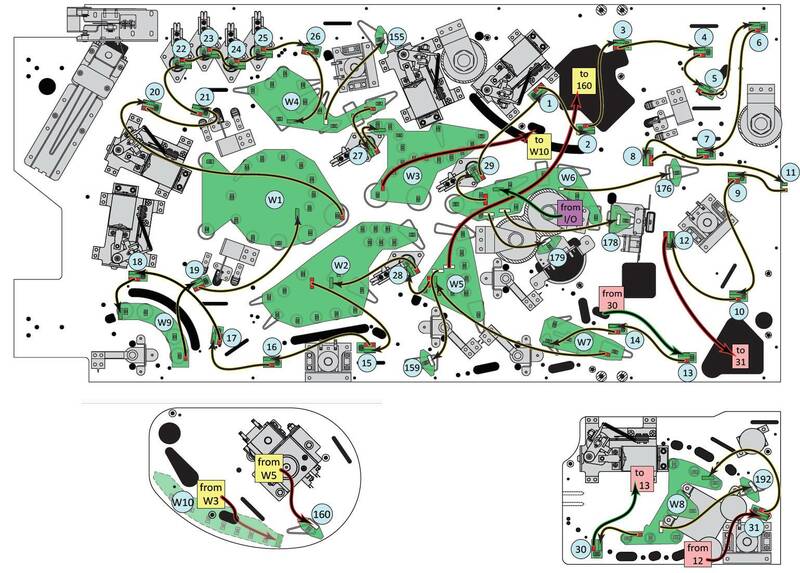 Until I had the lighting map seared into my memory eventually, I would manually walk through the board chain making sure I had the in and out connectors right, one by one, until I had checked the whole thing. Eventually I had spent so much time with it, I could Yoda it - FEEL it. HA, ok, thanks to you both. I'll get back down there with that helpful info. I'd sure love to save that $800 and put it towards a DI or PoTC. OK, so the board that seems to be the issue is W2. If I bypass it by taking the output of 28 and going directly to 15 then all of the rest of the lights turn on in the sequence. So, in the ALL LED test with WHITE on everything is turned on except W2, the red and green were still messed up and blue is fine. I then disabled W2 in the GAME SETTINGS menu and went back to the test. White is the same, red and green are ALMOST fixed and blue is still fine. There are only two LEDs now that are backwards for red and green, it's 15 and the R in RESCUE. I did just swap 15 for a spare board to see if the red/green issue was the board, so that could be isolated (no idea if the board I swapped in was good or not, it was just in the cabinet when I got it). I can swap another for 15 but obviously the R in rescue is part of a larger board (W8, I believe). So, I guess the question now is what would cause these two lights to be backwards. Is there still a board somewhere back in the chain that is an issue? Or would this be isolated to those two boards. I'll swap 15 just to see. Edit - Also, when in ALL LED test with WHITE there are two lights which are "pinkish". I don't know if that is just a failing of the board coming, something to be expected, etc. It's the O in TOTO and the lion rollover. They are definitely on the white side, but have a very dark pink hue. Tried to get a pic but doesn't come out. Again, not sure if this is a symptom of something related but I did notice this (and some others had a very light blue hue to them). I know it's RGB combined so again, might be expected somewhat. First, get the RESCUE issue out of the equation. That board may be bad, and it will affect all boards downstream. Because it's a pain to work on, just skip the whole mini playfield by jumping from board 12 to 13, skipping the mini-castle playfield entirely and take boards 30, 31, and W8 out of the mix on the system menu. Then see what the rest look like. You have to go in order from 1 to the end of the chain (NOT necessarily numeric) or the results won't be right and you might mark a good board as bad. 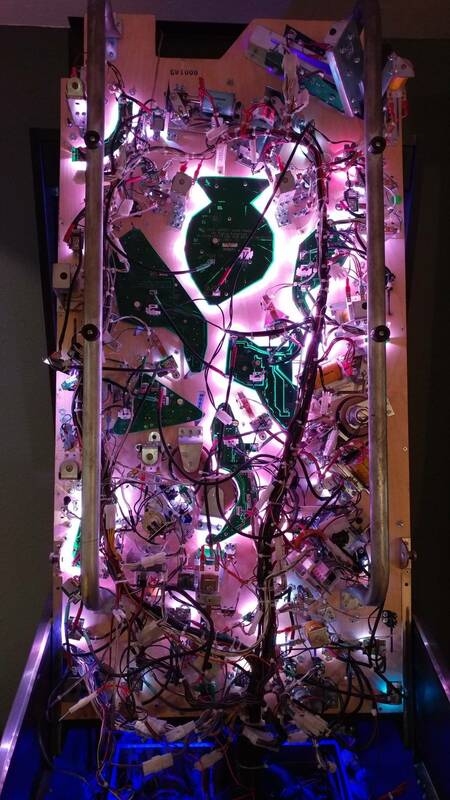 Even though the mini playfield castle board numbers say 30-31, and W8, which seem like they're at the END, they're really in between 12 and 13 in the chain, so that needs to be addressed first. Did swapping the 15 work? Your problem might not have been W2, it might have been 28, which made w2 look bad, and is now causing problems with 15. The first wrong light in your picture before was on W5, so I assumed that was the first bad board, but now, it actually might have been the "R"ESCUE board that was causing problems downstream. 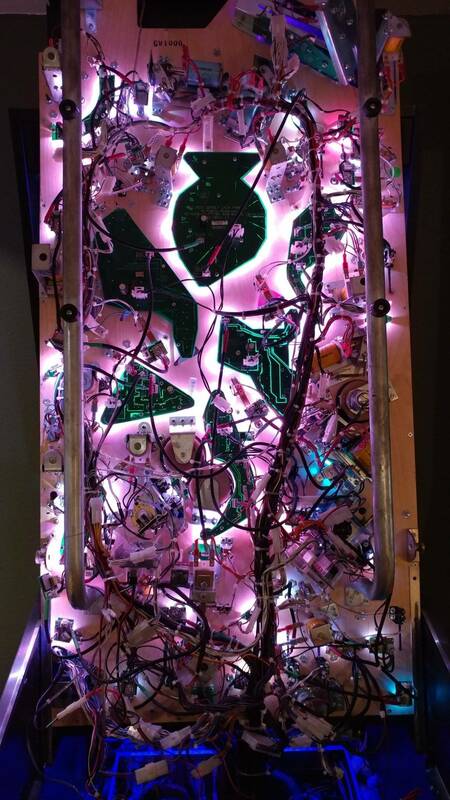 Once you have that, can you take another picture of the bottom of the playfield in Red and Green all LED mode? W2 is not on at all. When I went in to white test many other lights are green and red upstream. So I bypassed it physical and programmatically. Then all other lights are whiteish. When I test red and green I get messed up colors all along (just noticed I have two 14 boards, lol... One is 17). So ones like 14, 15, 16, 17, parts of W1, etc. You can see in pics. Skipping the castle playfield gives similar results. All white lights work except the skipped ones, green and red still messed up. 14 is the first "off" board in the red green issue. I skipped it as well and no changes were seen upstream. W5 was a larger board with one off color so I skipped that as well, no change. Changing 15 again to another spare board made no change. All the bypassing I am doing doesn't seem to change the red green issue. Pics are after all these changes were made. All boards that are disconnected are turned off in software. I'd put W2 back in the chain and bypass 28 in the chain by skipping from W5 output to W2 input, then update your board listings. Leave the mini-castle playfield bypassed by jumping from 12 to 13 for the rest of this debugging and make sure the boards up there, 30, 31, W8 are out of the system list. Having it in the loop will just complicate issues since one board is likely out up there. Take another PF pic when done. Ok, now I'm getting somewhere! So, firstly, I scrolled down the LED list further than I had before and found a LED off (I think #1) that I hadn't turned off. So I turned that back on (it's in the chain and does work). Then I made sure castle playfield related ones were still off and I pulled out 28 and put back in W2. W2 is definitely an issue.. when it is in the chain the lights end there. I then put W2 out of the chain as well (so both were out) and then all but one were working (it was #15 which was one of the ones I swapped with a "spare" earlier). I can tell some of my "spares" are used and bad, so I swapped another in there and it works! Just wanted to give you an update, I am going to go add back in the castle playfield ones and confirm. I'll also see if I have a spare to test in 28. Then it sounds like the only board I might need is W2. Is there some sort of board swap/repair/replace thing still? I thought I heard of that. If not, the board is $270 on JJP website, ouch. That one board might make the swap to the 2.0 worth it. Dang. Good that you're making progress now! I know when I was in 1.0 hell for 18 months or so, JJP worked with me on a LOT of boards that were discounted and I just sent the bad ones back, but I easily paid for a 2.0 update in that period of time with all the boards that were replaced (I did the whole machine - all the boards - once a then some over that period). So JJP will probably work with you, but even if they do, you're probably looking at $150, which is $150 that could go toward the cost of the 2.0 upgrade, then figure $200-250 for the used working boards you pull and sell on the pinside marketplace (that's what I did) and you've essentually cut the cost to $450 or less. Thanks, definitely what I'm thinking on the board situation. So to keep things isolated, I'm dealing with just one issue right now. I put 28 back in the rotation and it seems to work fine. I tried a few boards on it and it's good. However, 15 (which is right after 28) is always the wrong color (green/red). No matter which board I put in 15 or 28 it's always the same. If I remove 28 from the rotation then 15 is fine. I have 3-4 good working little boards so I tried several combinations across the playfield to just confirm and it seems like the issue is with position 15. So if it's not the board right before it, then what? The only other thought I have is cable. Sometimes the OUTPUT of the board before causes the board after it to fail, so I still think 28's output is your problem even though the input side and light seem to work. If bypassing 28 fixes the problem with 15, bypass it. The problem you have with your replacement boards is you don't know whether they are known good or were marginal or also defective, so don't use those as a measuring stick. Bypass 28 and move on until you get the rest of the chain right, then replace the bypassed stuff. Or just order the 2.0 kit instead instead of throwing good money after bad on replacement boards. <--theme of this thread I promise you'll have plenty of help on the 2.0 conversion and it won't be as bad or as expensive in the end as keeping the 1.0 system alive from here forward. Heh, Yea. I'm getting ready to pull the trigger. Thanks, I'll check it out tomorrow. Wonder if JJP has a warranty on boards. 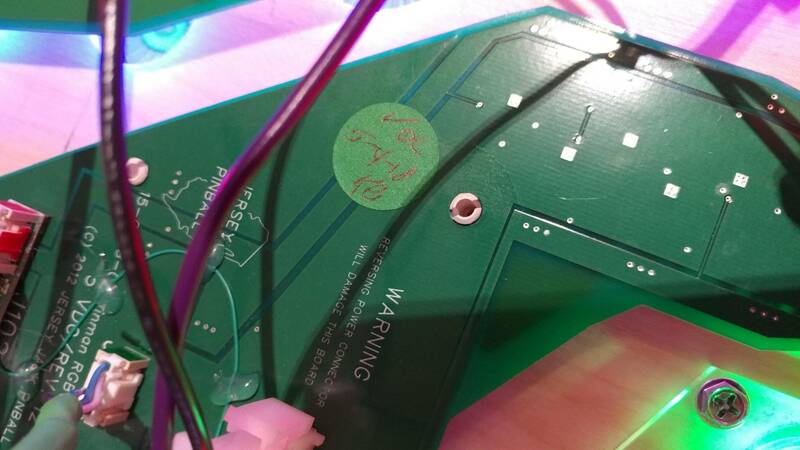 WOZ2 board has as sticker that looks like it was QC'd in 2018. Or just order the 2.0 kit instead instead of throwing good money after bad on replacement boards. &lt;--theme of this thread I promise you'll have plenty of help on the 2.0 conversion and it won't be as bad or as expensive in the end as keeping the 1.0 system alive from here forward. You are definitely right in 28 causing something. At least when I bypass it (and WOZ2, that is definitely bad... and I have the castle stuff still bypassed) all the rest of the lights work properly. When I add 28 back in then 15 is always wrong with the red/green. That is the only "wrong" board left and is only wrong when 28 is in. I have 6 "spare" mini boards. No idea if any are good but at least 3 of them light up properly when used in other places on the playfield, so I am going with those 3 being good. None of those have number stickers on them. One has #27 on it (which has been replaced in the game since #27 does not have a sticker now), one gets really hot and doesn't light up and the other has a really dim light. Not sure how many spares came with the game either. I tried the 3 "good" boards in place of 28 and every single one does the same thing with 15 being wrong. So, if the prior board physically isn't causing the issue (3 other boards do the same) I suppose it could be one of the cables? Or software related? I did just update code... not sure if the latest code, which is what is needed for the 2.0 lighting system, has some issue with the old lighting system? At this point it is narrowed down enough that I feel like I could call JJP again with specifics. Let me know if I should do that next. Ideally, I'd like to wait on the 2.0 kit if I can... trying to buy a PoTC this weekend. Not sure if WOZ2 has any sort of warranty, but if it does then investing in a mini board or something like that would be worth to keep this going for a bit more. JJP does have a warranty on a new machine's boards and they were very generous extending it for years past when they should have due to 1.0 problems, but your ECLE is LONG past that point, and I don't think it's a full year on replacement boards. Doesn't hurt to ask, though. Yeah, I popped off an email. It's a SE btw, #146 or something so WAY out of warranty. You would think a replacement board would at least have a year warranty but I also didn't buy this board so who knows what they'll say. If I have to contact the previous owner and have them help I might be able to do that too, in case that affects the warranty. If bypassing 28 fixes the problem, 28 is the issue, buy a brand new, known good board to replace it - ONLY. You have no way of knowing if the "replacements" kicking around inside the machine are really good, and the fact that at least two are obviously bad is not a good sign for the rest. Due to the serial addressing the other "replacements" you found could appear to work or kind of work on other places in the chain and still actually be bad. I wouldn't use those "replacement" boards for anything since you don't know their status and you could be introducing even more instability into the lighting system. So get this... I grabbed board #10, for sure a known working board, and swapped it with #28 and even still #15 was the wrong color. A known working board in the #28 position would solve #15 is what you all seemed to say, so what would still be causing this? Also, I went ahead and removed WOZ5 from the chain since it was immediately before #28 just to see if that would make a difference, nope. Also once boards start failing, it seems they don’t stop. So you fix this and more boards will likely fail again soon. Strongly urge you upgrade to 2.0 and never think about it again. Yeah, I hear ya. I'm strongly considering it. I need to follow-up on the one year old board and see if there is any recourse there. That could change things a bit in the near term and also for board resale value. But yeah, I definitely want to go in that direction. I sorta want to figure out the problems, even just to know what is wrong. I have the 2.0 kit in my cart, waiting to be paid for. Do you have the castle bypassed still and taken off the system menu? 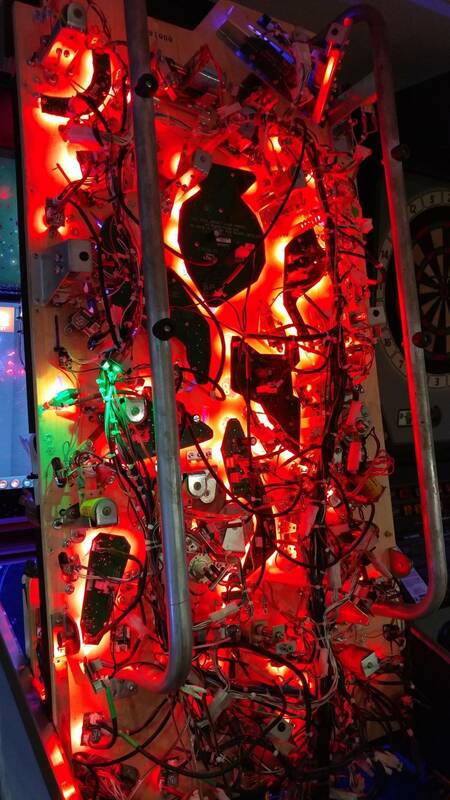 And all the lights have all 4 correct colors in LED test PRIOR to board 28 in the chain (INCLUDING THE MONKEY ARROW on the backboard you can't see from underneath)?